I can't believe it has been ten years, but what I wrote to friends and family about our very first visit with our son's neurologist, Dr. Jason Lerner, back in 2007 is still true: "He left us with the impression that excellent medical care and a friendly, compassionate bedside manner don’t have to be strangers." Over the years, he has seen us through many treatments for our son's Infantile Spasms, IEPs, hospitalizations and a clinical trial, answering all of our questions whenever we have them. 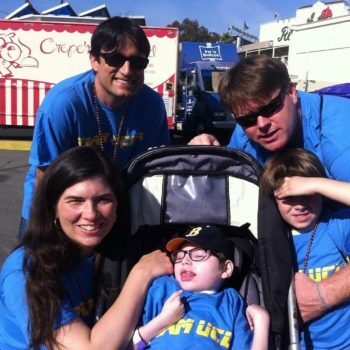 He has made us feel like members of a community with his leading a UCLA team at the Walk to End Epilepsy every year, an event we now look forward to. Under Dr. Lerner's care, we have always been made to feel—even though our son has not responded in miraculous ways to treatment—that our son is a whole being rather than a medical experiment, and that was exactly what we as a family needed when making the switch to UCLA all those years ago. Whenever we meet other patients' families, and even medical professionals who have worked with him, we all have the same thing to say about him—he's the best!